Great Taste And Garden Performance! 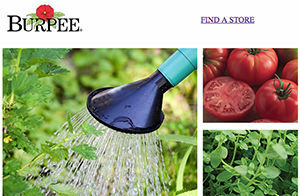 Grow it yourself with help from Burpee plants. Sign up for our newsletter for season-long support. Inspire your inner gourmet! Try these unique recipe thrillers. Big taste in half the space! These plants are patio perfect. Grow the best of the best for size and quality. The BOOST Collection is specially selected for higher levels of antioxidants. Fresh flavor on your windowsill all year long. Certified organic and organically grown vegetables bursting with flavor!